Jan DARETH (1636 – 1669) was Alex’s 10th Grandfather; one of 2,048 in this generation of the Shaw line. 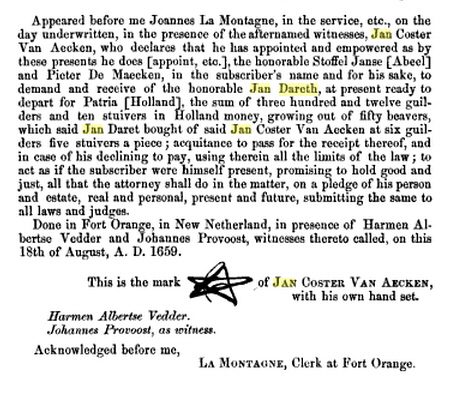 Jan Dareth was born about 1636 in Utrecht, Holland. He married Ryckje Ulrica Van DYCK after 1 Nov 1654 at the Reformed Dutch Church in New Amsterdam. 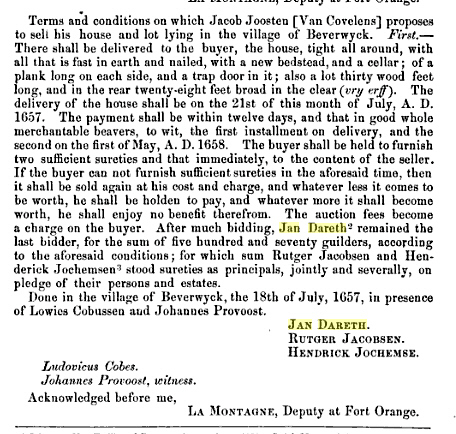 In 1657 he bought a house and lot in Beverwyck, where he became a permanent resident. Jan died before 10 May 1669 in Beaverwyck (Albany), NY. Ryckje (Ryckie) Ulrica Van Dyck was born about 1636 in Utrecht, Holland. Her parents were Hendrick Thomasse Van DYCK and Divertje Cornelise BOTJAGERS. She sailed with her parents from Amsterdam, 25 May 1640, in the ship ‘WATERHONDT‘, her father bearing a commission of ‘Ensign Commandant’ in the service of The Dutch West India Company, and accompanied by a company of foot-soldiers to reinforce the garrison of Fort Amsterdam. After Jan died, she married Jacob de Hinsse in 1671. De Hinsse did not live too long either and before too long, she married Jacob Staats and had two children by him. Ryckje died in Sep 1709. 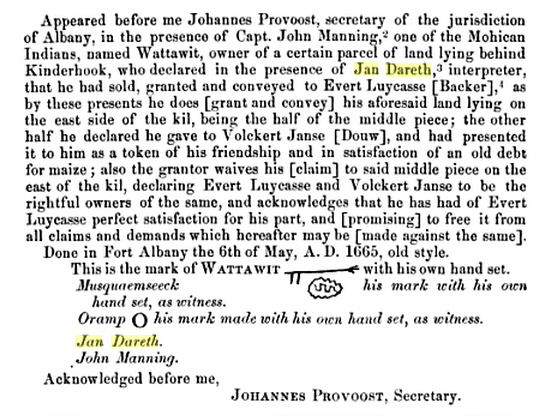 Jan Dareth was a gunstock maker, trader and interpreter. 1 Wilhem van Dyck was probably a brother , of Jan Dareth’s wife, Ryckje van Dyck, who in the register of marriages of the Reformed Dutch Church of New York, under date of November I, 1654, is entered as from Uytrecht, the same as Dareth himself. Ryckje’s father was Hendrick van Dyck, the schout-fiscal of New York, who arrived in 1640, and who was also from Utrecht. 2 Lijffrente off vicarye gefondeert op de Heerlicheyt van Nicuwenroode. Nieuwenroode refers to the manor of Nijenrcde, near Rreukelen, in the province of Utrecht, which on the death of Beernt van den Bongaard, in October 1641, was left to his widow Wilhelmina van Bronkhorst, she to have the use fruict thereof as long as she remained unmarried. On her marriage to Willem Vincent, baron of Wittenhorst, the estate reverted to Anna van den Bongaard, the sister of the said Beernt. The castle, which was accounted one of the finest in the province, was destroyed by the French in 1673, but afterwards rebuilt by Johan Oritt. See A. J. van der Aa. Aardrijkskundig Woordenbock der Nederlanden, 8:201-3; and picture of the castle in Robide van der Aa,Oud Nederland. While the term vicarye indicates that the annuity must have grown out of an endowment for religious purposes, probably in the form of a benefice in connection with the manor chapel, it is not to be supposed that Jan Dareth’s father ever performed any religious functions, as all vicarages in the province of Utrecht, except as a designation of certain kinds of church property, ceased to exist in 1580, when the exercise of the Roman Catholic religion was prohibited. Upon the secularization of this church property, the provincial states as a rule appropriated one-third of the income of the former vicarages to the maintenance of ministers, sehoolmasters and sextons and allowed the remaining two-thirds to be paid out to such beneficiaries as were presented to them, subject to their approval, by the donors, or their successors, the collators so-called. In cases where the benefice consisted of a life interest in land, this land was generally sold and an annuity equivalent to the income from the land was paid instead. The annuity mentioned in the above power of attorney was probably of that nature. I wonder what prevented Jan from returning to Holland like he planned. La Montagne, Clerk at Fort Orange. 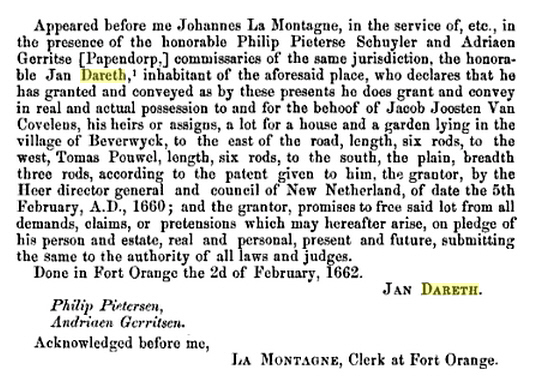 Appeared before me Johannes La Montagne, in the service of, etc., in the presence of the honorable Philip Pieterse Schuyler and Adriaen Gerritse [Papendorp,] commissaries of the same jurisdiction, the honorable Jan Dareth, inhabitant of the aforesaid place, who declares that he has granted and conveyed as by these presents he does grant and convey in real and actual possession to and for the behoof of Jacob Joosten Van Covelens, his heirs or assigns, a lot for a house and a garden lying in the village of Beverwyck, to the east of the road, length, six rods, to the west, Tomas Pouwel, length, six rods, to the south, the plain, breadth three rods, according to the patent given to him, the grantor, by the Heer director general and council of New Netherland, of date the 5th February, A.D., 1660; and the grantor, promises to free said lot from all demands, claims, or pretensions which may hereafter arise, on pledge of his person and estate, real and personal, present and future, submitting the same to the authority of all laws and judges. Done in Fort Orange the 2d of February, 1662. Acknowledged before me, Johannes Provoost, Secretary. Appeared before me Johannes Provoost, secretary of the jurisdiction of Albany, in the presence of Capt. John Manning, (Sheriff of New York) one of the Mohican Indians, named Wattawit, owner of a certain parcel of land lying behind Kinderhook, who declared in the presence of Jan Dareth, interpreter, that he had sold, granted and conveyed to Evert Luycasse [Backer],1 as by these presents he does [grant and convey] his aforesaid land lying on the east side of the kil, being the half of the middle piece; the other half he declared he gave to Volckert Janse [Douw], and had presented it to him as a token of his friendship and in satisfaction of an old debt for maize ; also the grantor waives his [claim] to said middle piece on the east of the kil, declaring Evert Luycasse and Volckert Janse to be the rightful owners of the same, and acknowledges that he has had of Evert Luycasse perfect satisfaction for his part, and [promising] to free it from all claims and demands which hereafter may be [made against the same]. Done in Fort Albany the 6th of May, A. D. 1665, old style. This is the mark of Wattawit — —** with his own hand set. Oramp Q his mark made with his own hand set, as witness. This entry was posted in 12th Generation, Immigrant - Continent, Line - Shaw and tagged Albany Pioneer, Indian Interpreter, The Waterhondt - 1640. Bookmark the permalink.